Equifax Data Breach: Are You at Risk? One of the biggest news stories of 2017 was the Equifax data breach. If you have never even heard of the company known as Equifax, there is still a good chance you were impacted by this massive cybersecurity incident. Find out what the Equifax data breach could mean for you and what you can do about it. In September 2017, Equifax, one of the three major credit reporting agencies, admitted a cybersecurity breach had occurred which compromised the personal information of up to 145 million people. The breach, which lasted from May to July, is one of the largest hacks in history. Second in size only to the two separate Yahoo breaches in 2013 and 2014, Equifax’s data breach will likely be the most damaging hack ever, considering the nature of the information that was obtained. A smaller number of people also learned their driver’s license numbers and credit card numbers were exposed. Equifax notified these individuals by email. The data obtained in the Equifax breach is the kind of information that identity thieves can use to create fraudulent credit accounts, hack into existing accounts, and/or file tax returns in the names of their victims. Due to the enormous scale of the security breach, there is a good chance your personal information could be among the data that was stolen. Any individual with a credit history is known to Equifax, although not every person’s information was compromised. You can quickly learn if you are impacted by the breach by visiting www.equifaxsecurity2017.com. With your last name and part of your social security number, Equifax can tell you immediately if they have reason to believe your information was compromised. If your personal information was part of the illegally accessed data, it does not automatically mean you will become a victim of identity theft. Banks and credit card companies have become adept at recognizing fraud. However, anyone impacted by the Equifax data breach should take steps to minimize their risk of identity and credit fraud. Those impacted by the Equifax credit breach can sign up for one year of free identity theft protection through TrustedID Premiere, Equifax’s credit monitoring service. You can also obtain free copies of your credit reports at annualcreditreport.com. Be aware of the signs of identity theft, which include unknown accounts on your credit report, unfamiliar charges to your bank or credit card accounts, and collection notices for debts you haven’t incurred. If you notice anything strange, visit identitytheft.gov to find out what to do. If you were negatively affected by the Equifax data breach, you may be entitled to a settlement for the financial losses you suffered. 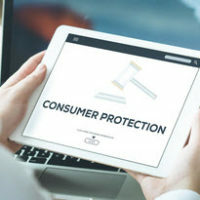 For more information about your legal options in the face of identity theft, reach out to an experienced consumer protection lawyer in your area. Contact Louis S. Schwartz at CONSUMERLAWPA.com today to schedule your initial consultation.